A very common form of adjusting where the doctor uses his hands to manually manipulate a specific joint. A technique that requires the usage of a specific type of table to add traction to the lumbar spine. This is excellent for patients with a herniated disc or spinal canal stenosis. A technique that requires the usage of a specific type of table that allows for the doctor to apply a force to a joint that results in a part of the table dropping a designated distance (around 1 inch). This is great for patients that do not like the diversified adjusting technique. A technique that requires the usage of a specific tool to apply a force to a joint. Often called a "clicky gun" by some doctors, it allows for areas to be adjusted without manual manipulation. This is great for patients that do not like the feel of a manual adjustment, children, elderly patients, or wheelchair bound patients. A taping technique that helps treat sport injuries and to enhance athletic endurance. It is also used for postural support to help patients improve their posture and for maternity patients during the various stages of pregnancy. 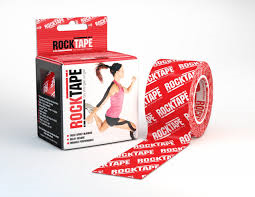 For more information check out this quick video of RockTape. A therapy that utilizes plastic cups and a vacuum pistol to create a suction on the body surface. This helps to facilitate soft tissue release by pulling toxins and inflammation from deep within the muscles. A vibrating massage tool that utilizes vibration with deep massage pressure. This helps loosen tight muscles, trigger points, and adhesions prior to the adjustment. A soft tissue technique that requires the usage of a specific tool to help aid in treating conditions such as muscle strains, trigger points, IT band syndrome, scar tissue, epicondylitis, joint sprains, swelling, and carpal tunnel just to name a few. A soft tissue technique that uses ischemic compression to eliminate trigger points throughout the body. A therapy that involves attaching small electrodes to the body to decrease pain symptoms. A therapy that uses ultrasound to facilitate healing by increasing blood flow, promoting tissue relaxation, scar tissue breakdown, and to decrease swelling and inflammation. Various exercises that are meant to complement each patient's unique treatment plan. 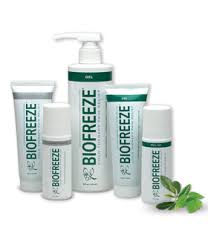 Biofreeze is a cooling pain reliever that contains natural ingredients. We offer custom orthotics through Foot Levelers. Rock Tape is great for stabilizing joints, improving muscle function, healing bruises, decreasing swelling, pregnancy support, plantar fasciitis, and much more!